This is getting published a little bit late (month and a half into 2014 already) but I still wanted to get this posted. Once again I’m setting some goals for myself for the year and posting them here publicly. You can read my past years goals (2010, 2011, 2012, 2013) and retrospectives (2010, 2011, 2012, 2013) as well. So with that let’s dive in. Blogging – I’m coming up on 5 years of blogging in a few months. Hard to believe it has been that long but as long as I have things to share I’ll continue blogging. It is great when I meet people in person that have been helped by tips, scripts, or other content I have blogged about. This year I know will be busy with a number of work projects but I plan to post at least one post of substance each month. Publish a productivity tool – When I started blogging back in 2009 the second blog post I ever posted was about how to enumerate SharePoint permissions from SharePoint 2007 with PowerShell. Last year in 2013 I posted an update for enumerating SharePoint 2010 or 2013 permissions with PowerShell. I would like to take the updated script and turn it into a tool that works for SharePoint Online as well since I see this as a gap area in tools / reports currently available for SharePoint Online. Continue taking annual vacations – This may seem like an odd goal, but taking some time off and disconnecting from work for a few days away from home is good at least once or twice a year. I also try to disconnect from technology while I’m away so minimal or no email, TV, video games, computers, etc. The next two goals help with sticking to that. 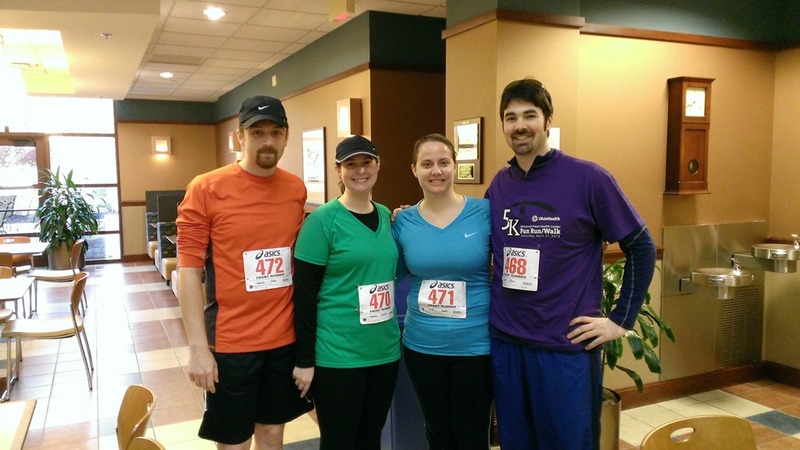 Running – In 2013 my wife (then fiancé) and I ran our first 5K. You can read the backstory on why that was such a big deal for me. This year I plan to run a quarter marathon (6.55 miles) and at least one other race (length undetermined). I’m already signed up to run a quarter marathon in May and I”d like to do one other race, perhaps something like Warrior Dash. Read books – As I mentioned in my 2013 retrospective I’ve really gotten into reading (physical, not just digital) books lately. I plan to read at least 3-4 books, many which I got as Christmas presents last year (see below). I’m really loving science fiction books (especially Isaac Asimov) lately and looking forward to finishing up the Foundation series. Buy a house – My wife and I are looking to move into something a little larger so we have room to expand our family in the coming years. We’re also preparing our condo for selling it by completing some home projects. Will be fun to break out some power tools. As I said with last year’s goals I like publicly posting my goals to hold myself more accountable but also to help inspire others to also create / post their own goals. If you decide to post your own goals feel free to send me a link as I would love to read. Here’s to a good 2014 year! This is my fourth year of setting goals publicly on my blog (2010, 2011, 2012, 2013) and going through a retrospective at the end of the year (2010, 2011, 2012). So without further ado here is my recap of 2013 goals. 2013 will probably be the biggest year in my life as it is the year I got married to my wonderful wife Sarah. Other notable events include getting promoted to Senior Premier Field Engineer at Microsoft, two of my sister-in-laws having babies, and helping out with some local conferences (including the return of SharePoint Saturday Columbus). Work local more – For the majority of 203 I was still on the road for a good portion of it. Thankfully towards the end of the year (just before my wedding) I was able to work out arrangements to do more local and remote work. I now have a few dedicated customers that are local or I work with remotely. That fills over half my schedule while the other portion of my time is doing a mix of remote and traveling engagements. Overall I’m (and my wife is) much happier with me being able to be home more. Mentor / Mentee – I started out the year with 2 unofficial mentees at work. Over the course of the year they have dropped off and we don’t meet regularly anymore. I still talk with one on an infrequent basis when questions arise. I’m ok with where things are at on this topic as a mentor / mentee relationship is only beneficial while both sides are willing to put something into it and also get something out of it. In these cases both are now moving along from the hurdles they originally faced. Blogging – I planned to blog at least 20 posts last year. Unfortunately I only wrote 18 posts. Part of this is due to my daily schedule changing quite a bit between work and personal life and part of it is due to not keeping a regular rhythm of writing down blog ideas that I flesh out. Currently I have a number of topics that I “haven’t had time” to write out. What that really means is I haven’t made the time for it. Something to work on for next year. Get married – As I mentioned above this was the big year I tied the knot with Sarah. Three months in and married life is great. We are both growing into our new relationship with each other and with God. Stay Fit – In 2012 I was able to lose and keep off 10+ pounds. In 2013 with the help of my FitBit One, going to the gym with my wife, practicing portion control during meals, and getting into running I took off another 5 pounds. I would’ve liked to lose a few more pounds but I’m finding that I’m adding muscle weight which I’m ok with. Read Books – 2013 was the year that I discovered science fiction books. I had listened to some audio books (most of the Robot series) by Isaac Asimov a few years ago. 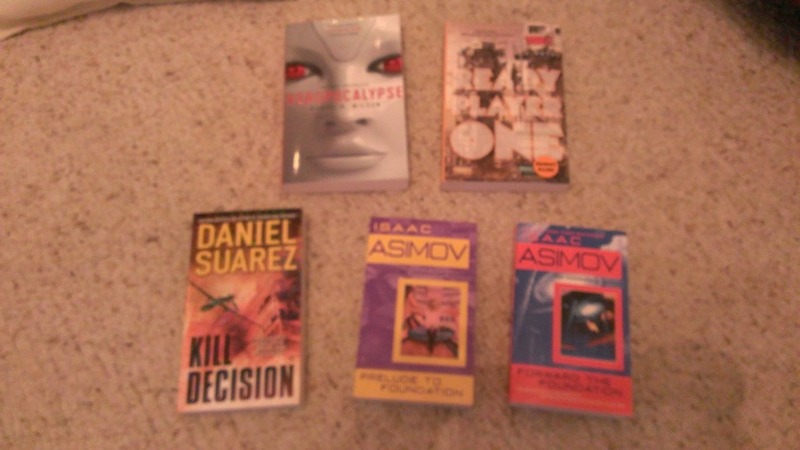 This year I found the first five books of the Foundation series at a local used book store. I’ve already read through the first 4 and have books 5-7 lined up to be read. I also read The Gods themselves by Asimov, Daemon and FreedomTM by Daniel Suarez, and Dance with Dragons by George R. R. Martin. That is more books / pages than I read when I was back in school. I asked for (and got as presents) a number of other science fiction and technology thriller books for Christmas so my reading list for 2014 is already stocked. I’m finding that I really like owning physical books rather than digital lately, similar to my new fascination with board / card / dice games (I’ll talk more about in my goals for 2014). I changed the focus of many of my goals for 2013 compared to 2012. I’m happy with the change in focus to more family and personal health type goals. I was able to meet and exceed most goals with only a few that were not met completely. After reflecting back on this past year I’ve already brainstormed some goals for 2014. I hope you had a good 2013 and that you set and stuck to some goals. If you’d like to share any feel free to put them in the comments below. Here’s to the start of a great 2014! This post is a bit more personal than most. Two weekends ago my fiancé and I (along with two friends) completed our first 5k run. To many people this may not sound like a big deal, but to me it was a very significant event. Below is the story why. When I was a junior in high school I started to have pain in my right hip when I ran or was on my feet for extended periods of time. At the time I was in track doing shot put and discus which are very demanding on your leg joints and muscles. When the pain didn’t go away for days and was uncomfortable just walking or sitting I decided to get it looked at by a doctor. The doctor took a number of X-rays and performed various mobility tests. Upon reviewing the X-rays it was clear what the problem was. My right hip joint was not properly formed. Specifically the socket portion of the “ball and socket” connection was under-formed and thus the ball portion slipped around causing inflammation. To the best of my memory he called it hip dysplasia. This is a somewhat common issue with newborn babies where the hip joints aren’t properly aligned or the ball remains out of the socket. In most cases some quick tests and manual adjustments pop the hip back into place. Apparently this wasn’t the case for me. At the time the doctor told me that I would need a hip replacement by the time I was 40-45, but to continue exercising and avoid any activities that caused pain. For me that meant no more running or climbing large amounts of stairs. Fast forward to a few years ago, I read an article discussing different running styles. One that stood out to me was toe running. Instead of landing on the heel (and absorbing all the shock with your bones) you focus on running on the ball or toes of your feet (and thus absorb the shock in your muscles). For a year I started to walk on the balls of my feet rather than the traditional heel to toe stride. I noticed a decrease in my hip pain as well as increased calf muscle strength. I then tried running on my toes and found it to be much easier than expected. I joined my fiancé’s gym at the beginning of this year intending to lift weights and do some minimal cardio. I started out with running half a mile and worked my way up to 2 miles. In Feb I found out the gym was holding a 5k run / walk for charity. I thought this would be a great opportunity to see if I could run the full race and not have hip pain. Sarah and I trained over the next few months increasing our distance and lowering our pace per mile. On April 27th, 2013 Sarah and I ran our 5K. I finished with a time of 32:59 (just under 33 mins 🙂 ) and Sarah finished at 34:56. I’m very proud of both of our times and for completing. The icing on the cake was that I had very minimal hip pain after the race (and even the days following the race). The below picture was taken just before our race. When my doctor told me that I wouldn’t be able to do many things that I enjoyed when I was younger it was discouraging. Thankfully through changing the way that I walk, run, and get around I’ve found ways to cope with my hip issue. I may still have to have an early hip replacement, but the fact that I could complete a 5K (with Sarah’s help and motivation) was a big boost to my confidence that I won’t let that keep me down. Now to find the next race and continue on! Another new year, another set of goals. Over the past few years I have set goals (2010, 2011, 2012) and done retrospectives at the end of the year (2010, 2011, 2012). This year already has a number of big changes in the pipeline but I’m trying to introduce a few other changes with the goals I am setting. Work local more – If you’ve been reading my blog the past year and a half you’ve probably heard me write that my new role as Premier Field Engineer with Microsoft has me traveling quite a bit (as evidenced by me hitting platinum status on Delta and Marriott last year). There are some changes at work which have me traveling less but I’m still away from home at least a few weeks a month. I am working towards doing more local and remote (from home) work. With my upcoming wedding I would like to be home more as spending time with friends and family is an important part of my life. Mentor / Mentee – Over the past 5-10 years I have had a few official and unofficial mentors whether through work, social groups, or otherwise. I currently have two mentors through work. I would like to build upon those relationships and also look for opportunities of becoming a mentor (not necessarily through work) for someone else. The latter may not happen this year but I would like to start laying the foundation for that. Blogging – I plan to continue blogging as I have been for the past almost 4 years now. I intend to blog at least 20 posts throughout the year. Get married – This Oct my fiancé Sarah and I will be tying the knot. I’m very happy and excited to be getting married as it opens a completely new chapter of our lives together. Stay Fit – Yes I included this last year and if you read my last retrospective I did lose 10+ pounds last year. With the upcoming wedding in Oct Sarah and I both have goals to lose a little more for this year. For me I am aiming to lose another 13 pounds by Oct and 15 total by the end of year. I’m planning to join a gym and have already bought a FitBit to track steps / sleep patterns / weight. I’m also continuing to eat healthier (most times) and practice portion control. Read Books – Purchasing a Kindle over a year ago got me reading more frequently. Now with my Surface RT I’m able to read easily on a device I travel with all the time. Win-win situation. This year I plan to read at least 5 books for the year. I was very happy to find my local library lends e-books and I’ve already started with Daemon by Daniel Suarez which is hard to put down. I’m also planning to track my books and post those as recommendations later similar to others (Todd Klindt’s book recommendations). I like the idea of managing things in groups of threes (which I picked up from 30 Days of Results) hence 3 personal and 3 work goals for the year. There are a few smaller goals I have that are targeted for shorter term timeframes as well. This year is looking to be another good year and I’m eager to tackle the challenges and opportunities that come. On a side note, when I first started posting my goals in 2010 I called out a close friend Sean McDonough to also post his goals online. As it turns out this year Sean did finally post his goals and join the bandwagon. Thanks for carrying on the torch Sean. Since Sean posted his I’m going to call out a few of my coworkers in hopes they will also post their goals for the year: Josh Gavant and Ashley McGlone. Now in my third year of an annual tradition I have set goals (2010, 2011, 2012) and gone through retrospectives (2010, 2011). So here goes a recap on the year that was 2012 and how I stacked up against my goals. Similar to 2011, 2012 was a big year for me. In 2012 I proposed to my now fiancé Sarah (pictures), I completed my first year with Microsoft as a Premier Field Engineer, my middle brother got married, my oldest brother and his wife had a baby, Sarah’s sister and husband found out they were pregnant, my mom had a total hip surgery, I wrote two chapters for a new book (more details about this once it is closer to publishing), and I helped out with various conferences and projects. As you may have noticed a number of these items are family related which has been a bigger focus for me this past year. Blog – I set a goal to blog twice a month but did not meet that goal. I only had 18 blog posts throughout 2012 but they were fairly well spaced out through the months. It has been more difficult to keep up with blogging given my travel schedule with work, increased family commitment, book writing I was involved with, and other factors. I still plan to continue blogging as long as I have content / ideas to write about. Speaking – I had a goal of speaking at 3 user groups and / or conferences in 2012. I spoke at 4 events in 2012 (PowerShell Saturday Columbus, SharePoint Cincy, SharePoint Saturday Twin Cities, and SPTechCon Boston). As intended I reduced the number of events I would speak at compared to 2011. Due to frequently traveling for work it is difficult to spend a weekend or part of a week away when my time at home with friends and family is already limited. Going forward my speaking commitments will greatly depend on family commitments and travel schedules. Open Source – I intended to work on two separate open source projects. I did not complete any additional work on SavePSToSP for a variety of reasons but mostly because my time was better spent on other projects and goals. I have worked on the SharePoint diagnostics project with my coworker Eric Harlan but have not gotten to publishing the project or blogging on it. This may see the light of day in 2013 but we shall see. Volunteering – I assisted with planning Stir Trek again in 2012 as well as a new conference PowerShell Saturday which we held the first ever in Columbus. I’ve also been involved in the local Buckeye SharePoint User Group (BuckeyeSPUG). Stay Fit – My goal for 2012 was to lose 15 pounds. I ended up losing a total of 16 pounds by November but with the holiday food fests ended the year 11 pounds lighter than I started the year. With our upcoming wedding this year Sarah and I have continued goals to lose a few more pounds. Read Books – I set out to read at least 2 books. With the Song of Ice and Fire (Game of Thrones series for you TV-only folks) I read the first 4 books. Additionally I read a couple marriage prep books. I wish I had kept a list of when I read certain books as they are a blur looking back now. I like what Todd Klindt did and post the books he read throughout the year. I may do the same for next year. Overall I met (or came close to) many of my goals for 2012. Aside from these goals I also set a midyear goal for improving my personal productivity which I blogged about. So far I have seen an increase in my personal productivity mainly by how many things I have cut out of my life that are / were unnecessary. Despite reading some articles about not setting goals I still find the process very worthwhile and will continue into 2013. I even found a series called 30 Days of Getting Results which very much builds on the idea of setting 3 attainable goals for the day / week / month / year and then doing a retrospective at the end of the respective time period. I have not fully adopted this system but have incorporated a number of the concepts into my daily life. I hope 2012 was good to you (as it was to me) and you are refreshed coming into 2013 ready to tackle new challenges and continue growing. A few months ago during my first end of year review at Microsoft I was doing an assessment of my year. One of my personal goals to come out of this reflection was to improve my personal productivity. While I hear many people say “I wish I had more hours in the day so that I could get more done” I feel like that is the wrong approach. There is an inherent assumption that you are being productive with your time that you already have and thus more time would allow you to be as productive given more time. Note: A number of these topics have spawned from reading Scott Hanselman’s blog posts on productivity, reading of David Allen’s book Getting Things Done, and discussions with friends and coworkers who had great insights into this topic. I highly recommend Scott Hanselman’s video above and this post before continuing with this article. It is well worth the 40+ mins price of admission for the video and couple minutes for article. One key takeaway for me was listing out my activities in an average week and realizing which ones held little or no value to me. We all have a finite amount of time to work each day. Do you know how much time and effort you spend on various aspects of your life (family, friends, religion, work, personal happiness, etc.)? Do your actions and commitments reflect your priorities? The biggest time consumers with little value for me were time spent on social media services (Twitter and Facebook), playing an MMO video game, and watching TV. I still check up on Facebook, Twitter, Microsoft internal chat forums, and other services to keep contact with others but I’ve reduced that time significantly. As for TV I’ve cut the cord and no longer subscribe to cable TV. Instead I use Netflix, RedBox, and over the air channels but again with reduced time consumption. With the time I’ve freed up I’m back to working out 2-3 times a week and reading 4 nights a week (both of which I had been neglecting previously). I’ll mention a few tools for helping measure your time in the Tools section. Do not multi-task. I’ll say it again. Do not multi-task. There is no such thing as multi tasking. The human brain is optimized to work on one thing at a time. When you are “multi-tasking” you are really doing 2 or more things at less than 100%, usually by a wide margin. I take pride in my work and when I’m doing something less than 100% the results typically degrade rapidly. Now there are some ways of bending the rules of physics for this one. There is the notion of getting a double amount of work done in the same timeframe. Some examples would be listening to podcasts / watching a movie while working out, using a treadmill as your work desk, or reading while in the bathroom. Personally I’ve found good results in combining one task that does not require focus (making dinner, playing certain video games, working out) and one task that does (watching a movie, listening to podcasts). I believe this is related to me being a visual and kinesthetic (using my hands or actually doing it) learner. I’m terrible with auditory learning. My fiance and I joke that sometimes we talk and talk to each other but never really hear each other. Goals can give us direction in life and a sense of accomplishment when we complete them. Goals can also overwhelm us and give us a sense of failure when we don’t complete them. I propose that you shift your perspective and not dwell on all of the things that you haven’t gotten done, but focus instead on regularly setting measureable goals that are within reason of accomplishing. At the end of each time frame have a retrospective to review your progress. Do not feel guilty about what you did not accomplish. Feel proud of what you did accomplish and readjust your goals for the next time frame to more attainable goals. Here is a sample schedule I’ve seen proposed by some. I have not consistently set goals for each timeframe, but I do typically set 3 small goals a day (this blog post is #2 for today). Tools are an extension of our human body. They help us extend beyond what we can physically and mentally do. Below are some tools I use almost daily or have found useful as of late. Disclaimer: I am not getting endorsed to promote any of these products. I just happen to like them and find them useful. Stacks for Instapaper – A Windows Phone 7 app for reading my Instapaper articles on the go. It does require a subscription to Instapaper (nominal $3 every three months) but is easily worth the cost. Alternatively you can set up your Kindle to sync with Instapaper easily but I haven’t done so. News.me – News.me is a web service that will aggregate the top stories from your Facebook or Twitter stream and then send you a daily email. I used to use a service that got bought by Twitter a few months ago, but I’ve honestly forgotten the name of that company. I now use a combination of News.me and Instapaper to read news stories on my time schedule instead of constantly checking Twitter all day long. SlapDash Podcast – Apps for Windows Phone and Windows 8 (possibly other platforms) to sync podcast viewing / listening across multiple devices. Now that I have my Surface RT device (which I love) this is making my consumption easier to manage. Feed Reader – Simple Windows 8 app for quickly catching up on my RSS feeds. I used to have hundreds of unread items all the time. Now I’m down to 20-50 regularly and it is much easier and faster to consume on my Surface RT. There is also a free version (which I use) and I can’t see much different between the free and paid versions currently. Rescue Time – Have you ever wondered how much time you’ve spent on websites vs. email vs. “doing work”? This service tracks your computer actions and then lets you report on them. This can help you quantitatively identify areas where your actions are not in line with your priorities. PowerShell – Windows automation tool. It is now built into every client and server OS. This tool has saved me days (and I mean the full 24 hrs worth) of time and effort in the past year alone. If you haven’t started learning PowerShell and are administrating any Windows OS or server product you need to start learning PowerShell today. Various blogging tools – I wrote a post a couple years ago called How I Blog about my blogging process and tools used. Almost all of it still applies today. Some of these may be common sense or debatable, but I’ve found them to help prioritize my daily activities. Get plenty of sleep on a regular basis. Sacrificing sleep too many nights a week negatively impacts your cognition, attitude, and overall health. Exercise at least three days. Exercise could be lifting weights, taking the stairs up multiple flights of stairs, walking for 20 mins, or a number of other “non-traditional” activities. I find that regular exercise helps with sleep and improves my overall attitude. Eat a well balanced diet. Too much sugar, caffeine, junk food, etc. are not good for your body. This is not a matter of losing weight but taking care of your body and helping you perform at your peak potential. Email can be one of the biggest time consumers (i.e. waster) if you aren’t careful. Time box your email usage. Set a meeting invite for yourself if necessary to limit how much time you spend checking email. Use rules to prioritize your email. Email from external customers, my manager, or include me directly on the To line go into my inbox. Everything else goes a level down and I have 30+ rules to further sort it, mostly distribution lists. Use keyboard shortcuts (when available). I use Outlook for my primary email and am constantly hitting Alt + S to send, Ctrl + 1 for my inbox, Ctrl + 2 for my calendar, Space / Tab / Shift + Tab to mark items as read, and a number of other useful commands. Learn them and you’ll see your speed getting through emails increase. Keep emails short. No one Few people like reading through long emails. The first line should state exactly why you are sending the email followed by a 3-4 lines to support it. Anything longer might be better suited as a phone call or in person discussion. In this post I walked through various tips and tricks I’ve found for improving personal productivity. It is a mix of re-focusing on the things that matter, using tools to assist in your efforts, and cutting out actions that are not aligned with your priorities. I originally had a whole section on keyboard shortcuts, but with my recent purchase of the Surface RT I’m finding that touch gestures have replaced numerous keyboard commands that I used to need. I see a big future in touch enabled devices. Hopefully some of these tips help you out. If you have any tools, tips, or ideas you would like to share feel free to add in the comments section. This is a short personal post to let any regular readers know what I’m up to (and why I’ll be in reduced blogging mode for a bit). There are some other community and personal commitments taking up my time (in addition to normal work responsibilities). Since the number of hours in a day is limited to 24 hours I’m making a late addition to my goals for 2012 for the year of learning and adopting more personal productivity practices. Before the end of this year I’ll be posting a couple that I’ve already adopted that are working well for me. Scott Hanselman posted a great video recently that sparked me down this path. I highly recommend you watch.